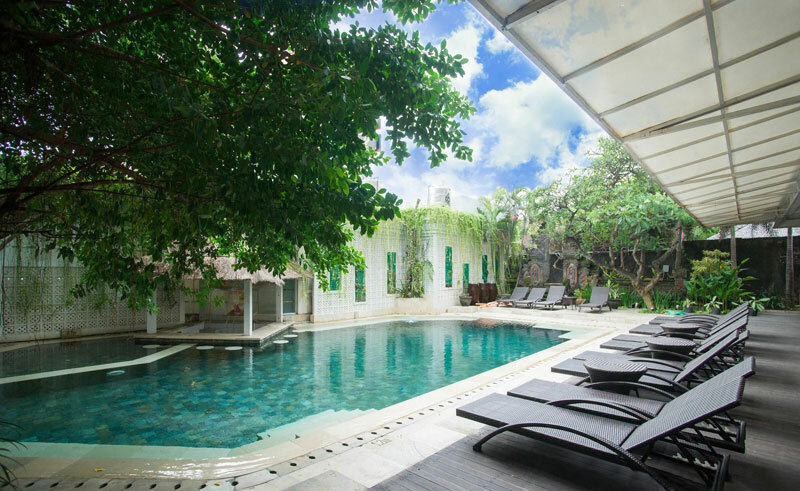 Looking for a budget hotel in Bali that’s just steps away from the beach? Well who isn’t, with the soft white sand, clear water, and the warm salty breeze on this paradise island? If you’re looking for a beachside hotel that has a pool (because why choose between the two? ), but find yourself on a budget, and don’t mind a hotel that doesn’t have direct beach access from your room, yet is less than 10 minutes’ walk to the beach, we’ve dug out the best deals for you! 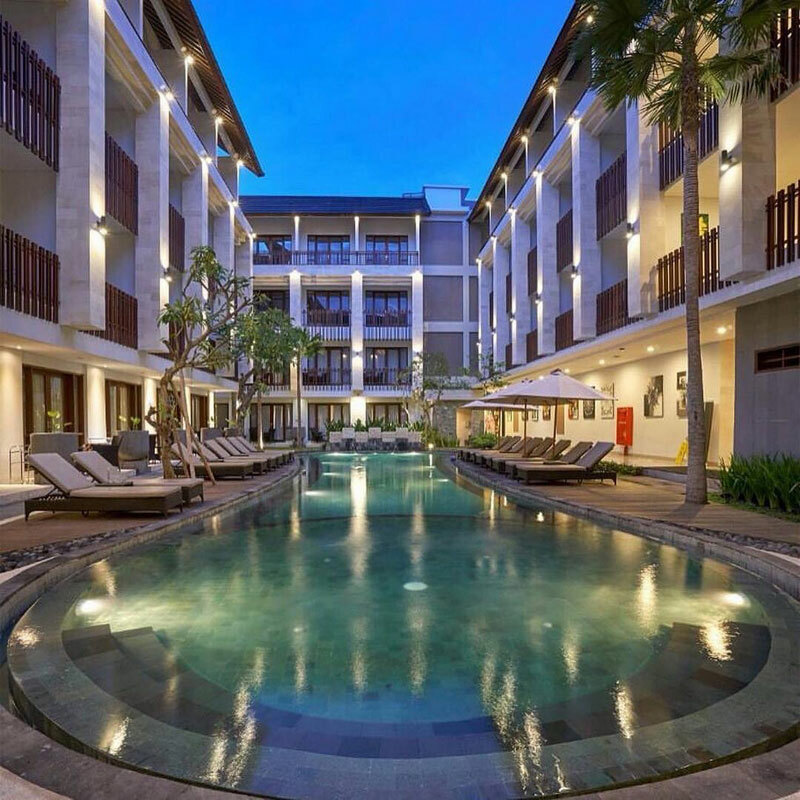 Even better, these hotels are located in the most happening areas of South Bali, so you don’t need to walk far to restaurants, cafes, boutiques and souvenir shops! From the pool to the sand, and offering everything imaginable in between, here are 10 hotels that give you the luxury you crave without breaking the bank. Note: The prices reflected below are the low season rates, and they exclude tax and service charges. Accommodation rates often change with room availability, and low or high seasons. We recommend double checking for the final prices before confirming your booking. 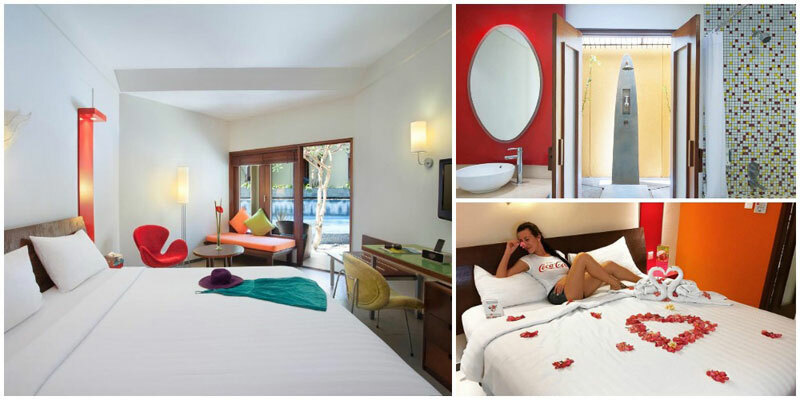 Located right infront of Kuta Beach, Citadines Kuta is the best place for those who love a spot of tanning. Enjoy an afternoon of tanning by the beach as you wait for yet another famous Bali sunset – with a beer (or two) in hand. If you’re looking to get a massage on the beach, you’ll also be happy to know that good massages are available here (and at very affordable prices too), thanks to the ladies offering massage services on the beach! Love to eat? 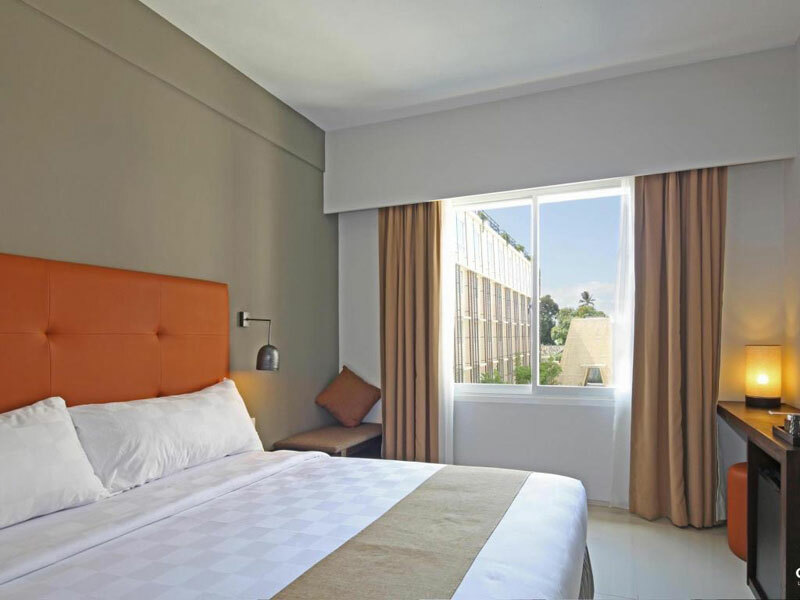 Staying at Citadines can only mean that you’re in the right place to try the variety of food in this Kuta area. There are cafes around for you to easily pop into, and delectable street food such as meatballs, roasted corn, or salad. 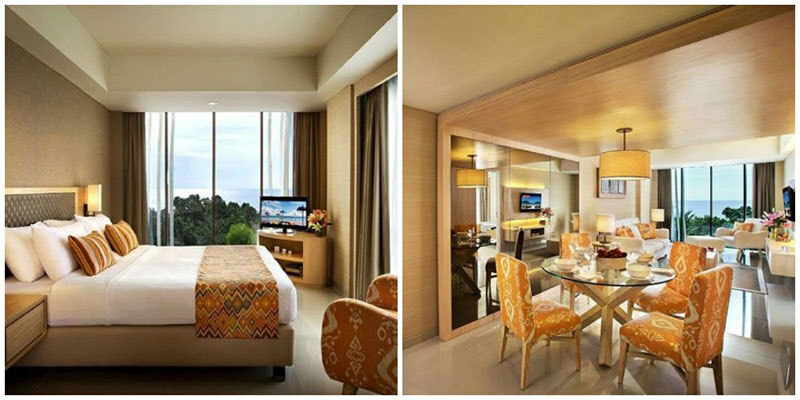 Citadines is also suitable for those planning for a longer in Bali, thanks to the in-room kitchenettes available. Feel free to cook whenever you’re getting a little tired of eating out – though we highly doubt you’ll tire of the delicious grub available. Lastly, another fantastic feature of the hotel you won’t want to miss? 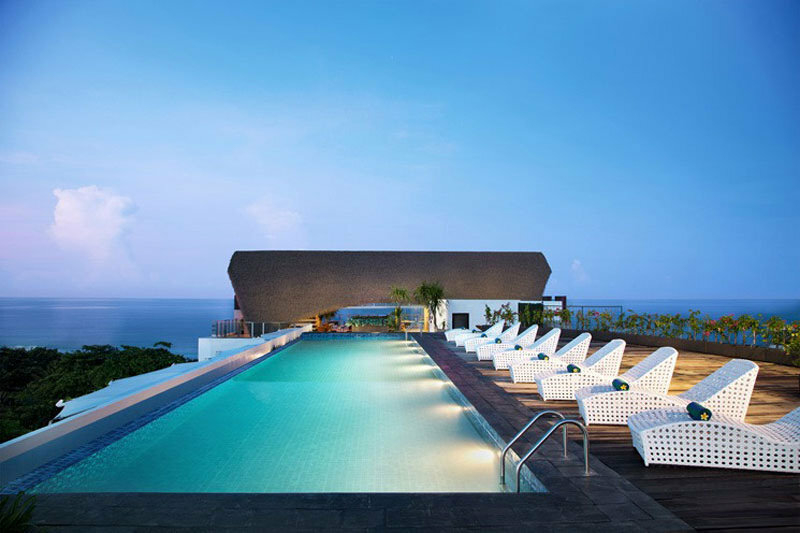 The lovely rooftop infinity pool. Imagine relaxing at the pool while enjoying the scrumptious views. With a name like Sol House, it’s no surprise that this is a place for fun in the sun! 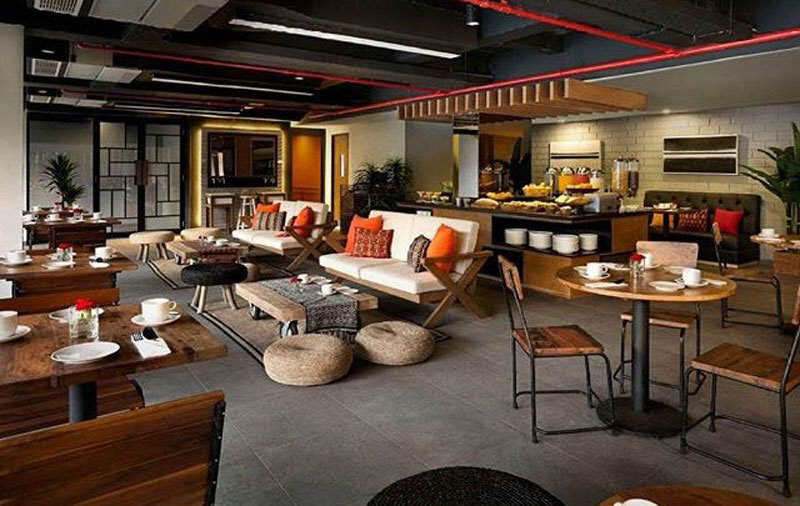 At this inviting hotel, there’s a myriad of things to do, no matter how you like to spend your time! 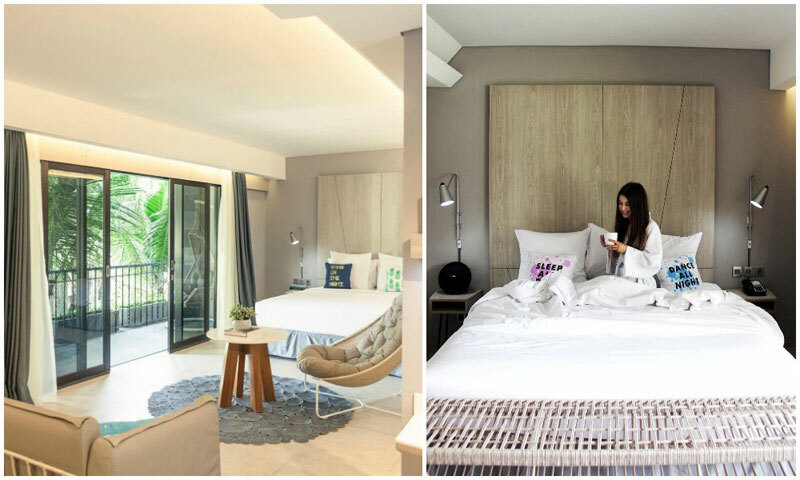 The cozy rooms feature bright, clean decor, for an airy and relaxing feel. Don’t miss the weekly live music performances and daily DJ sessions by the oversized rooftop jacuzzi pool at Solsets – ideal for that sunset cocktail! There’s a range of activities offered in the hotel, so you can be sure you will be well entertained. If you don’t feel like lounging in your room, take advantage of the huge, crystal clear pool for a perfectly relaxing afternoon! 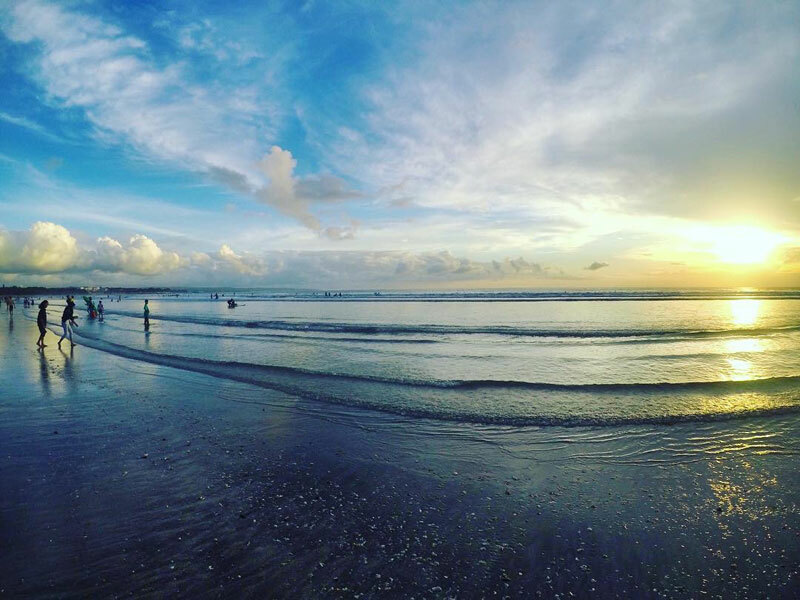 And since the beach is only an 8-minute walk away, why not spend a day at Legian Beach? If you’re feeling too energized and restless to lounge on the sand all day, why not try out some adventurous water activities? You can learn to surf, snorkel, or scuba dive! 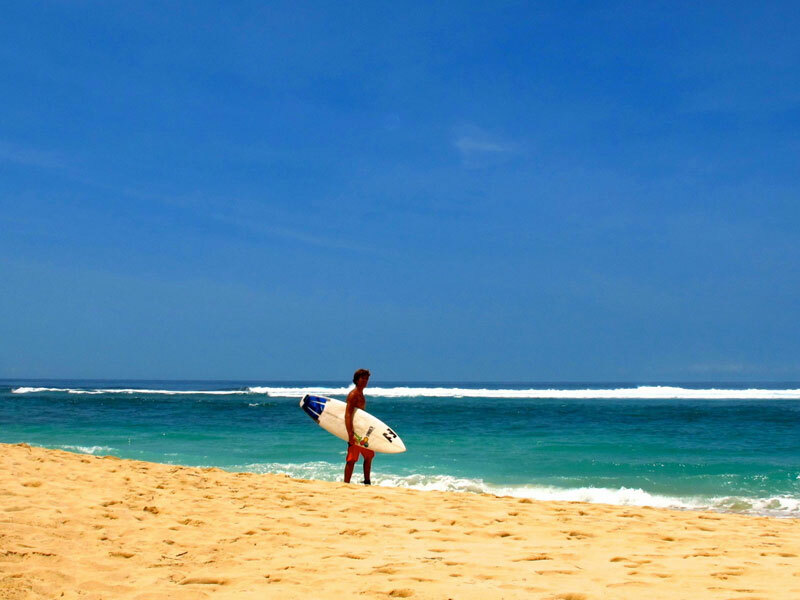 And in the clear, warm waters of Bali, there’s no better place to try something new. 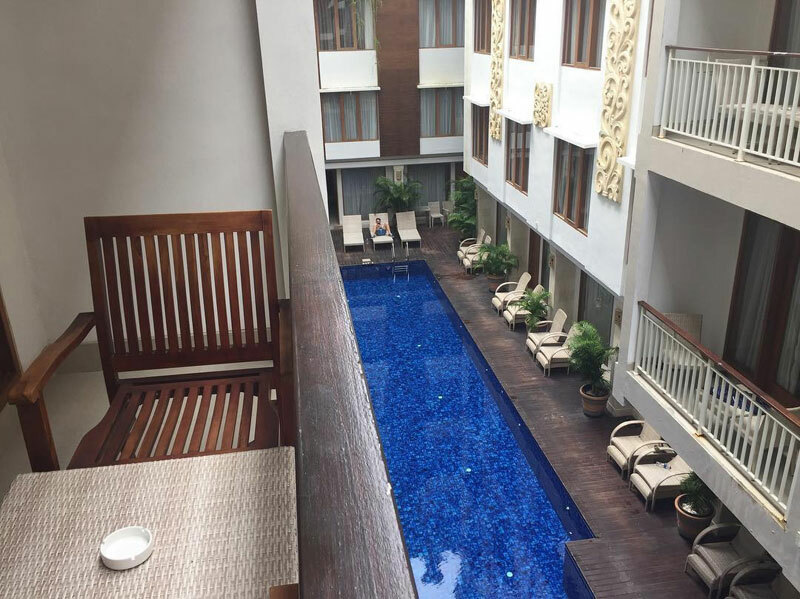 Fourteen Roses Beach Hotel is perfectly placed in a prime location in the heart of Kuta, so getting from the pool to the beach and back again is only a short walk – 10 minutes, to be exact! 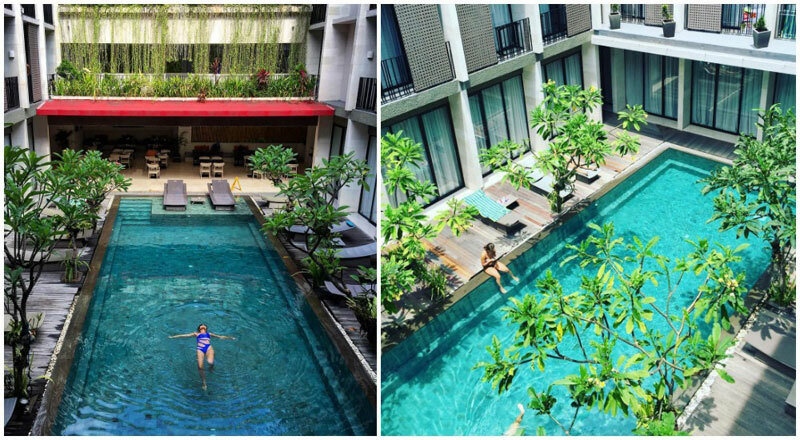 The pool is crystal clear and perfect for those sizzling hot Bali days. Lounge poolside (with a cocktail, of course! ), then take a dip in the refreshing water! If you’re getting a little restless at the hotel, then why not take the short walk down to the shore? Throw some beach fun into your afternoon; lounge on the warm sand, or go for a refreshing dip in the ocean waves. If you’re done in the water for the day, the evening is a perfect time to head towards the streets and enjoy a night in town. Dinner, drinks, and dancing – the hotel is perfectly located for a wonderful night of fun! 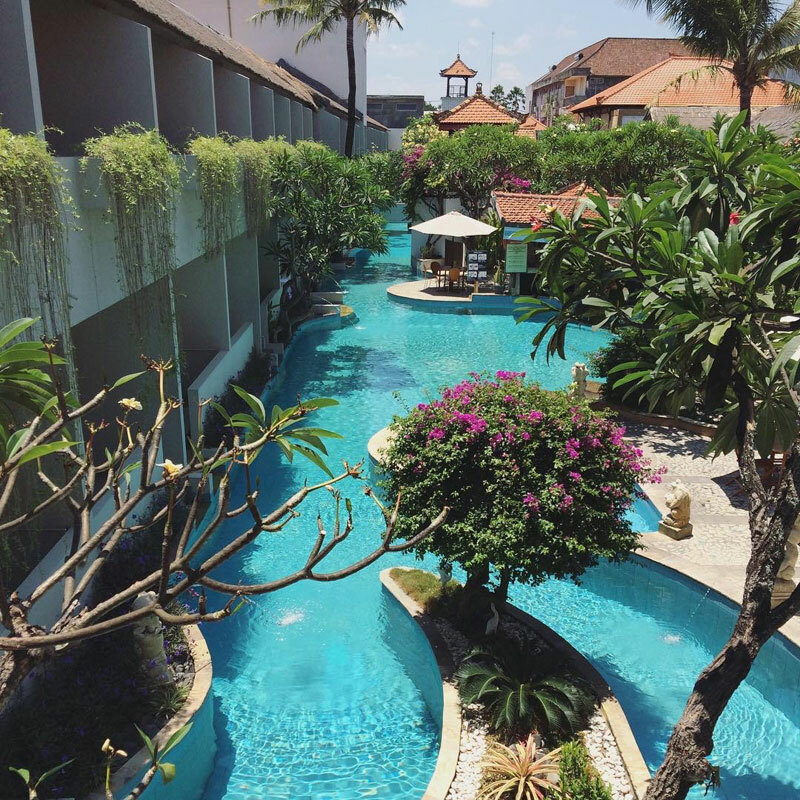 Merely a 20-minute drive from Ngurah Rai International Airport, Best Western Kuta’s bright colors will fill your Instagram feed almost instantly. 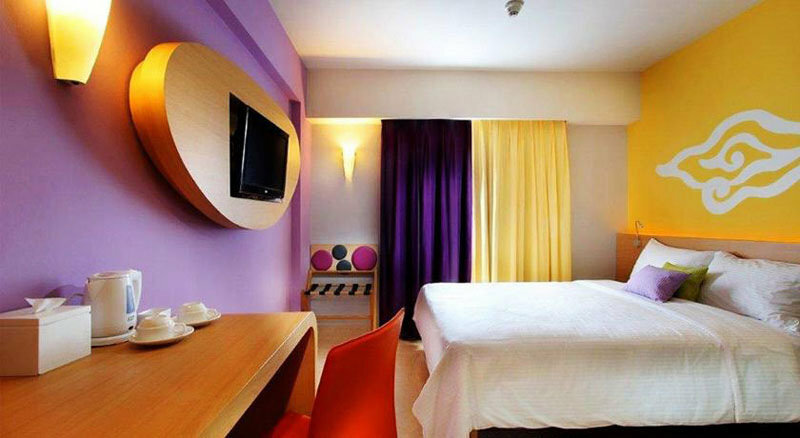 The rooms boast a super chic design with Best Western Kuta’s signature mix of bright colors, and you will feel fully at home. 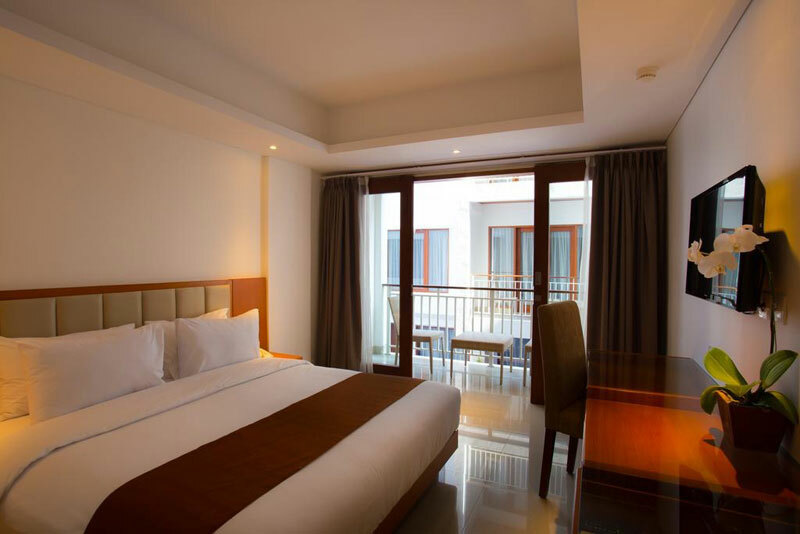 Picture yourself resting in their comfortable rooms after ‘tough’ days of shopping and beach livin’ in Kuta – doesn’t it feel just like the holiday of your dreams? Looking out for some great nightlife and shopping? You’ll be happy to know that both nightlife and shopping are only a 10-minute walk away! 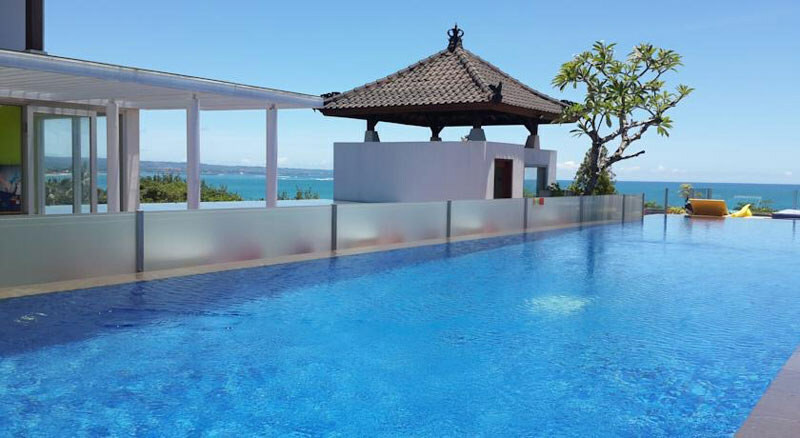 How could we forget to mention – Best Western Kuta’s pool is located on the rooftop. This means a superb spot for lazy lounging, and maximum sunbathing so you go home with the perfect tan. 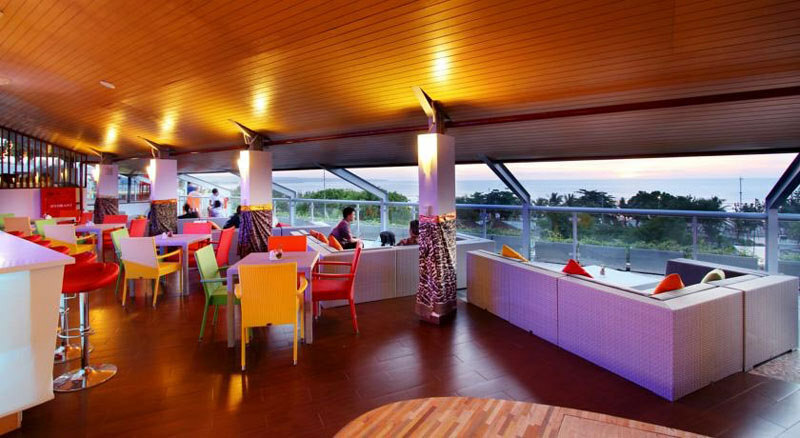 PS: There’s also a bar where you can enjoy spectacular sunset views without having to go anywhere else! Who doesn’t love palm trees? The Grand La Walon hotel pool is a paradise set into the centre of the hotel, surrounded by palm trees and plants to give you the impression of being amidst a tropical oasis. Thirsty? There is poolside beverage service (the best thing ever, who’s with us?). The beach is nearby, only a 6-minute walk until you’ve got the ocean waves lapping at your toes! You can lounge on the sand or sign up for watersports at the nearby service stands. Surfing, anyone? For all your relaxation needs, the hotel spa offers a wide range of services – everything from basic facials to couple packages. Get ready to be seriously pampered! And when you can barely keep your eyes open, the comfortable and stylish bedroom will be a welcome refuge at the end of the day. Sleep the night away cozy, comfy, and rested! If you are a mermaid, you will love the affordable Pool Access Room, where you can slip into the water directly from your room. If you like to people watch, the upper storey balcony rooms are a great place for a little added privacy, somewhere where you can sit and relax with a late-night tea as you unwind! 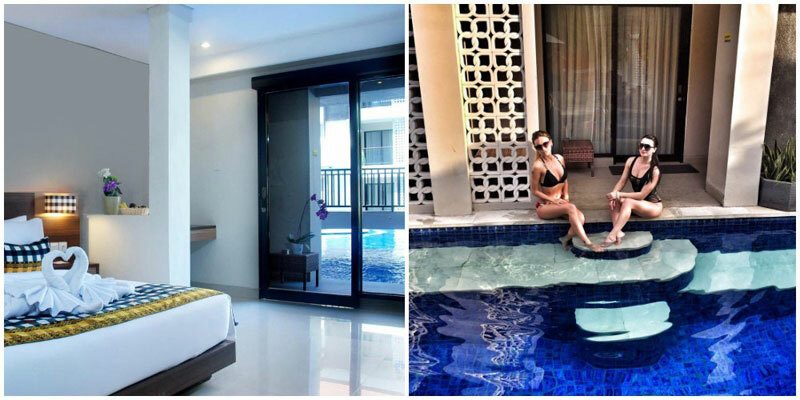 The Kuta Lagoon Resort & Pool Villa is truly a quiet little oasis – a slice of heaven in the heart of Kuta. Don’t miss out on the unique pool! It’s truly a masterpiece of Balinese design, with winding channels, strategically placed plants, and fountains spewing delicate streams of water. Perfect for those lazy poolside afternoons in the sun! The perfect mix of coziness and laidback island vibes awaits you when you return to your room after a long day of fun in the sun! 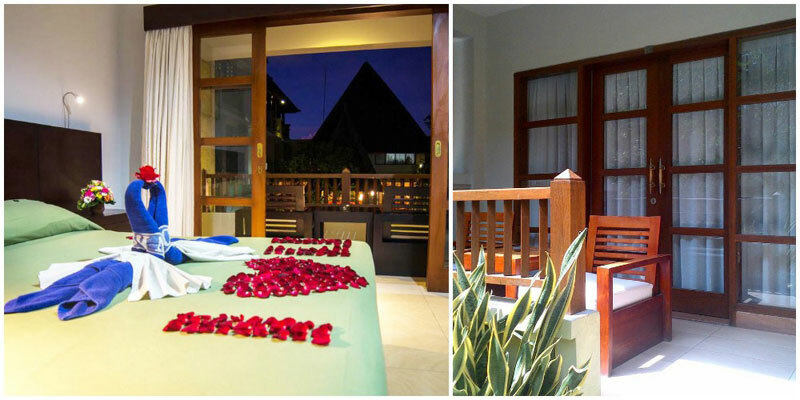 But if you want something a little extra over the usual lagoon access room, check out the private villas – perfect if you’re travelling with your love! For something a little different, a fun way to spend an evening would be to check out the onsite karaoke bar at the Palm Room! Don’t forget to step out of paradise (just for the afternoon!) to check out the many shops, bars, and restaurants just minutes away from your place. And that’s not even mentioning Kuta beach, which is less than 10 minutes away by foot! 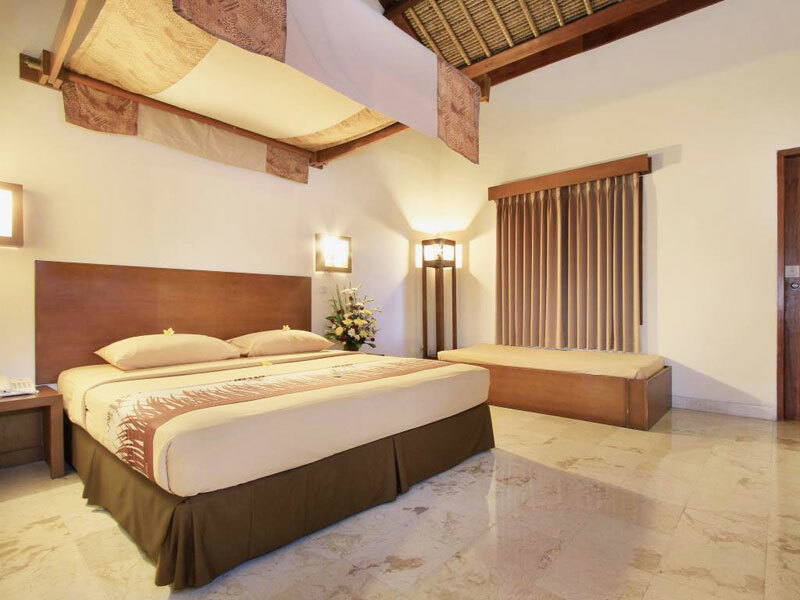 The Ananta Legian Hotel has it all. 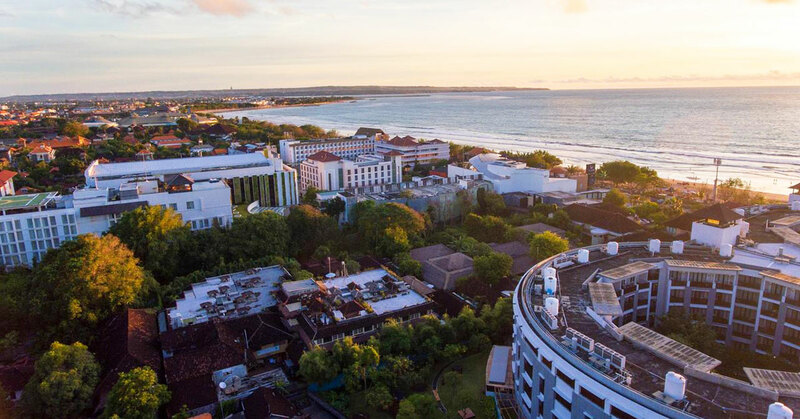 Apart from the crisp clear pool and the 5-minute walk from Kuta Beach, you can unwind on the Ambara Rooftop Lounge and sip some refreshing drinks at the bar as the sun sets. 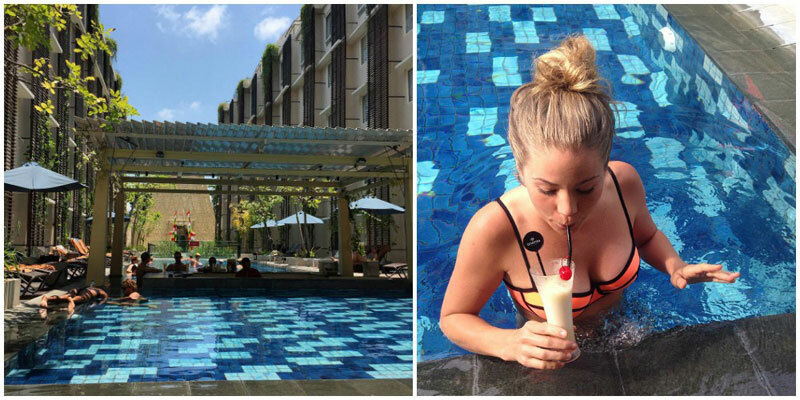 If you spend an afternoon in the pool, don’t forget to take advantage of the swim-up bar! We’re pretty sure fruity drinks taste way better when you sip them in the pool. 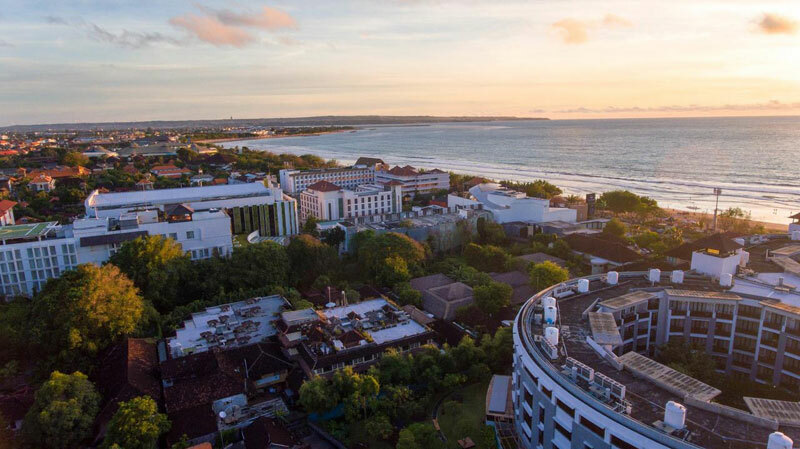 If you get tired of sun and sand, grab your sandals and head out to Legian – it’s just a short walk to tons of artisan shops, clothing stores, and restaurants. There’s definitely something for everyone in this corner of the city! After a day of adventures under the Bali sun, you can return home to your room, crawl into the big comfy bed and drift off feeling relaxed – and wake up feeling energized and ready for a new day! Enjoy your breakfast by the poolside, or have a true breakfast in bed. How much better can the morning get? If you like luxury on a budget (it’s actually possible! ), Maharani Beach Hotel will be the perfect escape from reality. 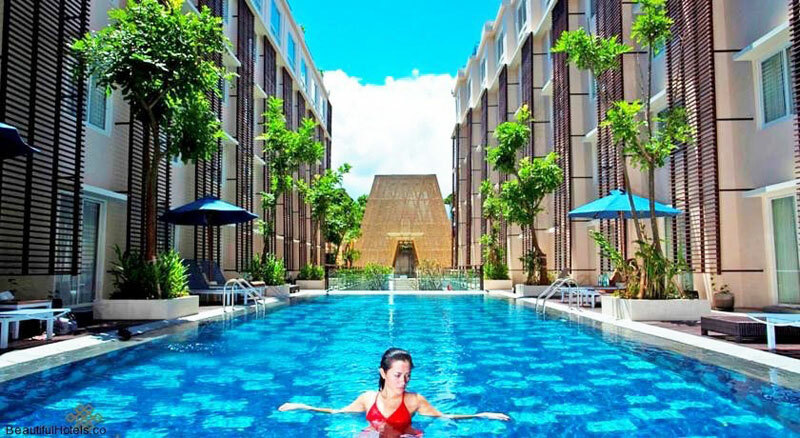 The lavish pool right by the dining area will be surely your most-frequented part of this hotel. 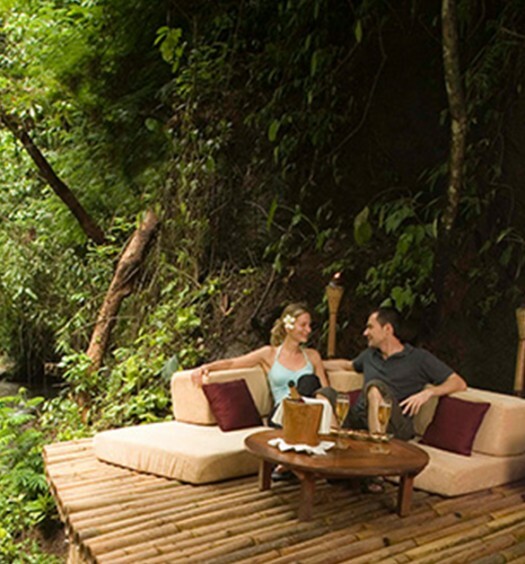 But if you want to spend a day outside the hotel (who wouldn’t, when Bali has so much to offer? 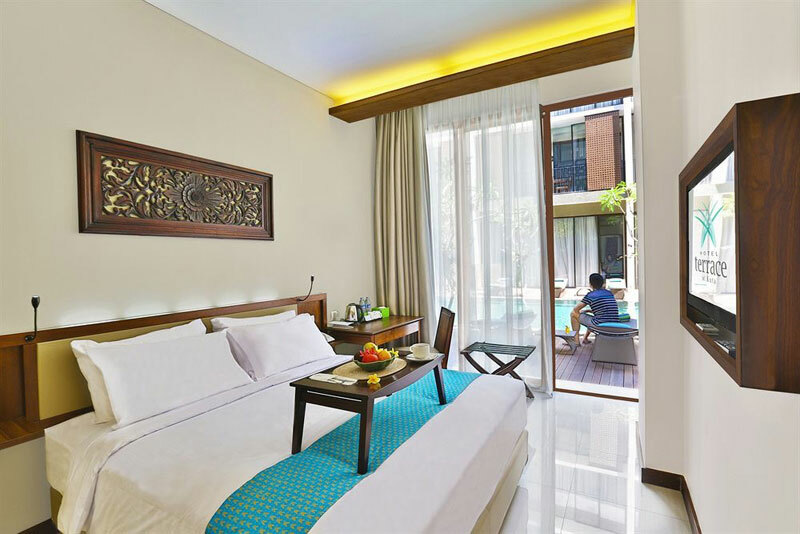 ), the famed Kuta Beach is only a minute’s walk away, since Maharani is conveniently located right on the sand! The hotel also boasts of a fully-equipped spa offering an endless range of treatments, from the classic Balinese massage to aromatherapy, facials, and nail art. All your pampering needs will be well-attended here! 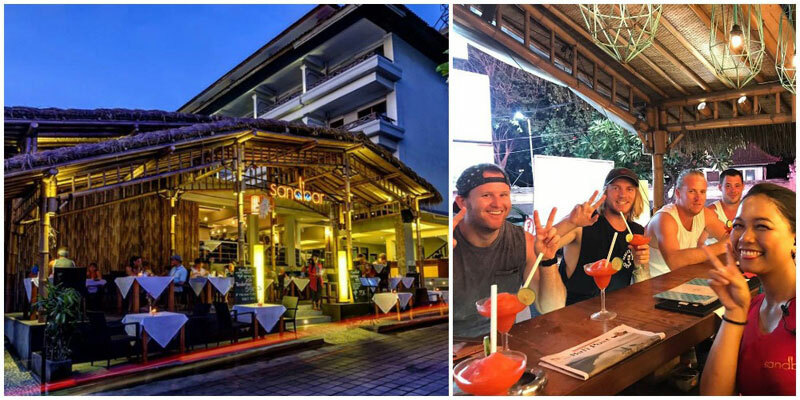 At night, if you fancy a bit of nightlife, you’re only minutes away from Bali’s most happening clubs, bars, restaurants and boutique shops! 9. 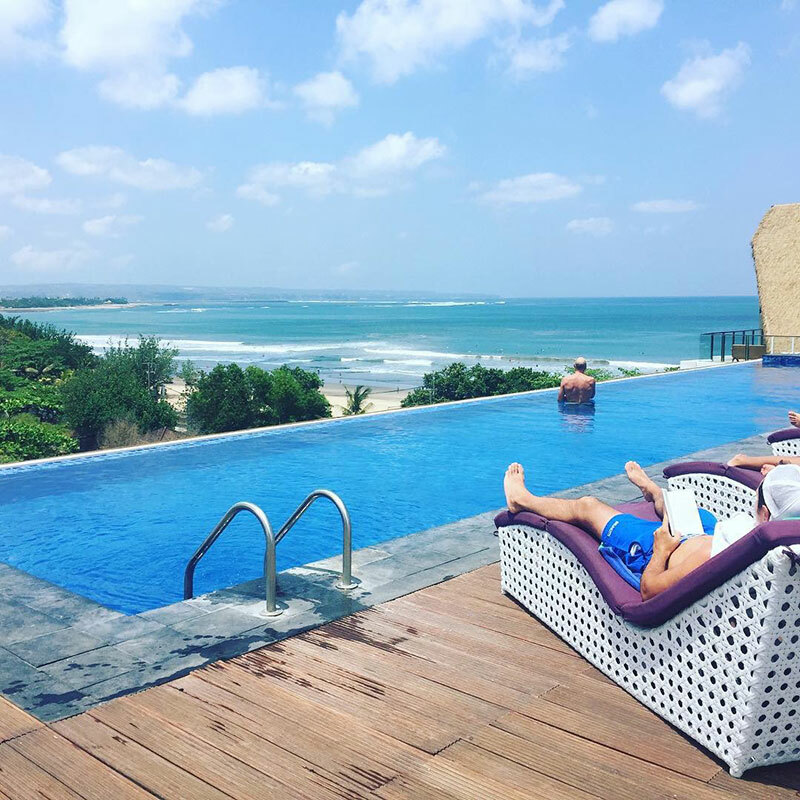 The Sun Hotel & Spa Legian – Slip from the bed to the pool! At The Sun Hotel & Spa, there’s something for every type of luxury you crave. For the most value-for-money affordable luxury, choose between a balcony room overlooking the pool, or pool access room if you want to be close to the water’s edge! Both feature cool, chilled-out designs that make you feel instantly relaxed upon coming back from a busy day. Bonus point of the pool access room – this room is perfectly located for you to slip out of the terrace doors and immediately into the refreshing water for an early morning (or late-night) dip! The hotel’s spa, Prabha Spa, offers not only facials and nail art, but hair treatments too. Great for hair parched by the sun! Fancy a night in with some fine dining? Check out Eclipse Bar for great food. If you want to experience the local nightlife, awesome bars and restaurants are just a short walk away! 10. 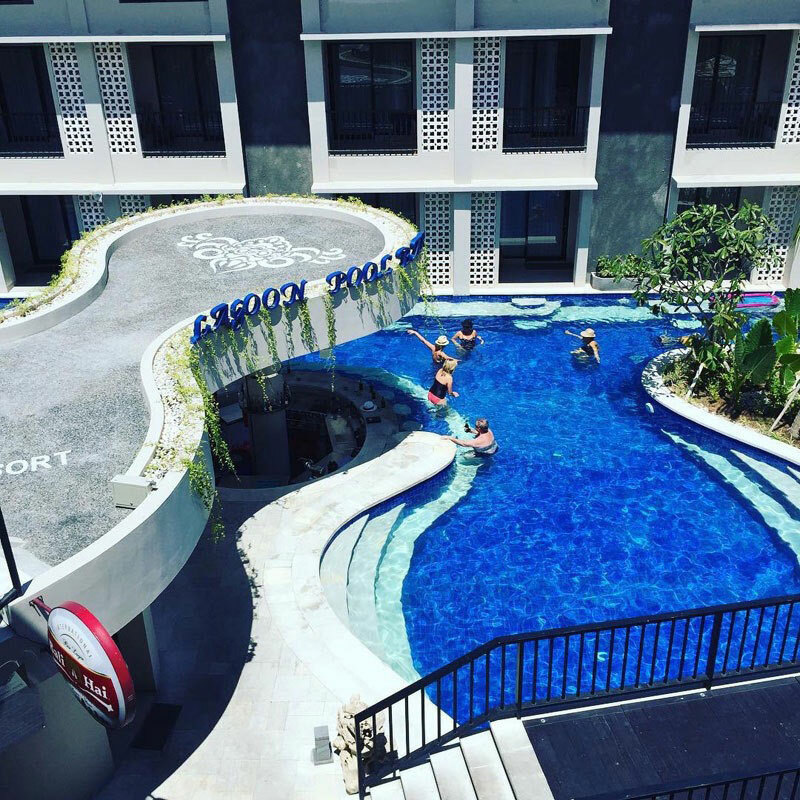 Grand Barong Resort Bali – A splash for the whole family! Welcome to Grand Barong! 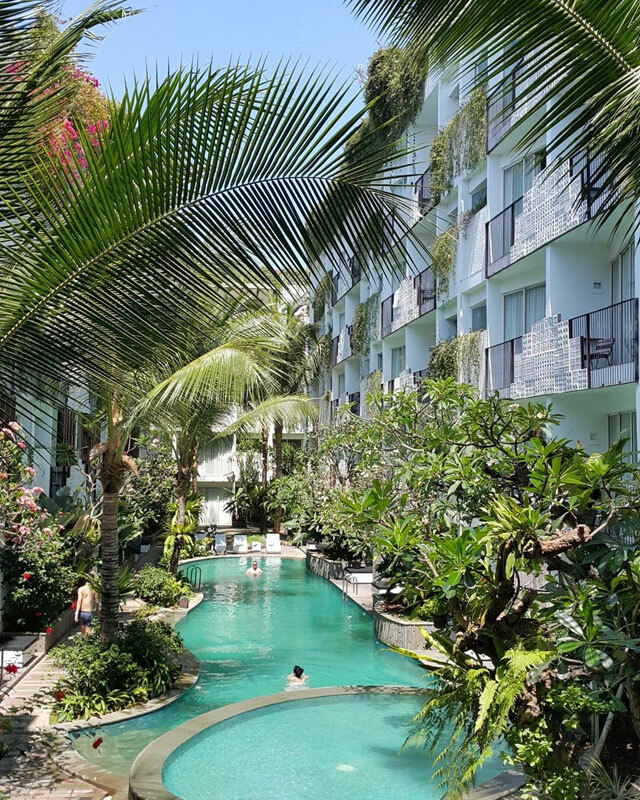 This hotel is one of Kuta’s best-kept secrets, centrally located for the perfect mix of day plans – whether you intend to stay floating in the pool, splashing around in the ocean at Kuta Beach, or hitting up the local shops and restaurants which are only minutes away from the hotel. 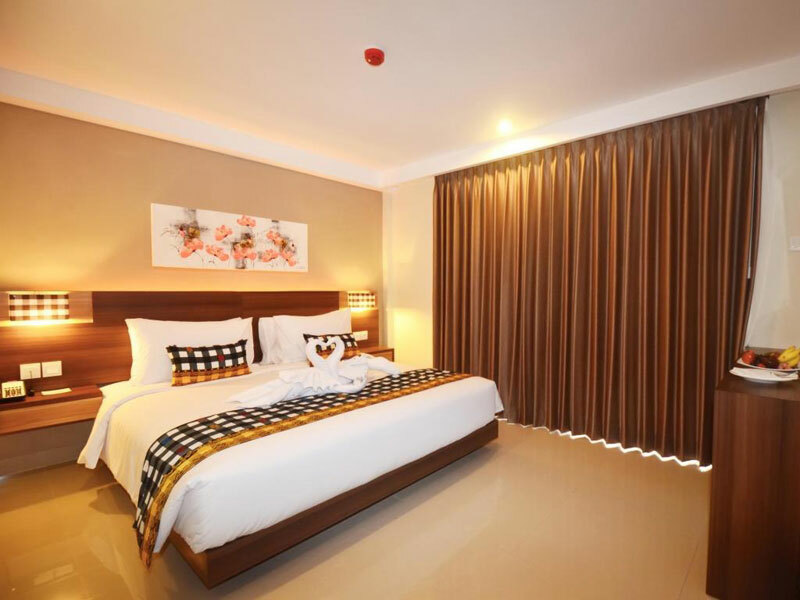 With a wonderful mix of luxury and affordability, the clean, tidy rooms are equipped with all the amenities to make your stay perfectly comfortable. Craving for a little bit of luxury? You can actually step from your room into the hotel pool if you opt for the Lagoon Access Suite, so you’ll never be far away from a quick refreshing dip! Afterwards, return to your perfectly cool, air-conditioned room and make yourself a coffee (provided daily). Delicious! 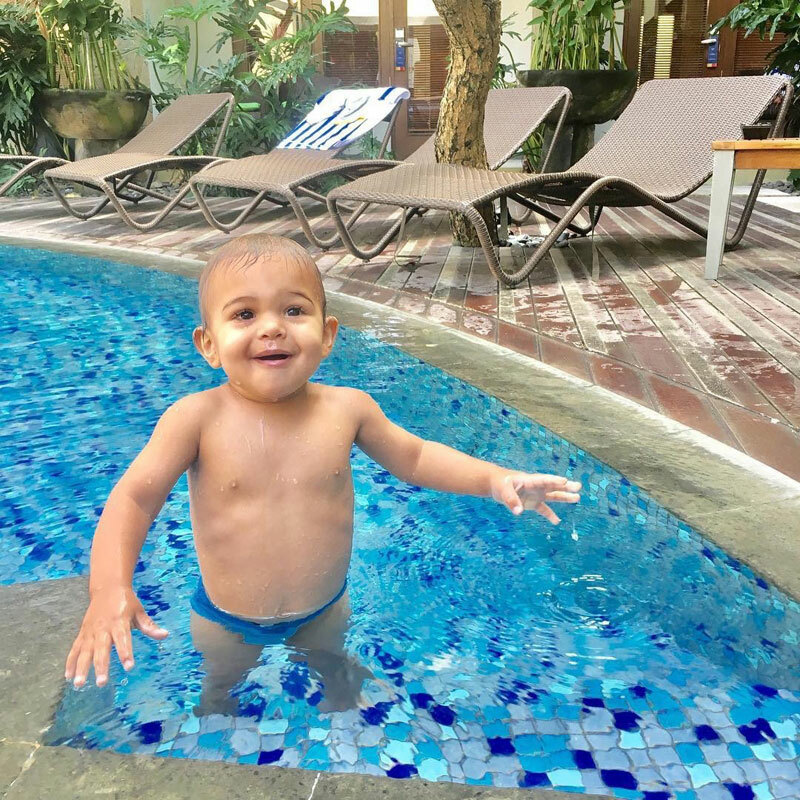 If you’re travelling with little ones in tow, they will love the kids’ pool and the kiddie playground! And the entire family can swim together, without leaving your kids’ needs behind. Happy swimming! Who doesn’t love a pool access room? Isn’t this ideal for water babies who are always game for a swim? This makes a quiet early-morning dip super easy and super relaxing – it’s also perfect for a late-night swim under the stars (hello, romance!). 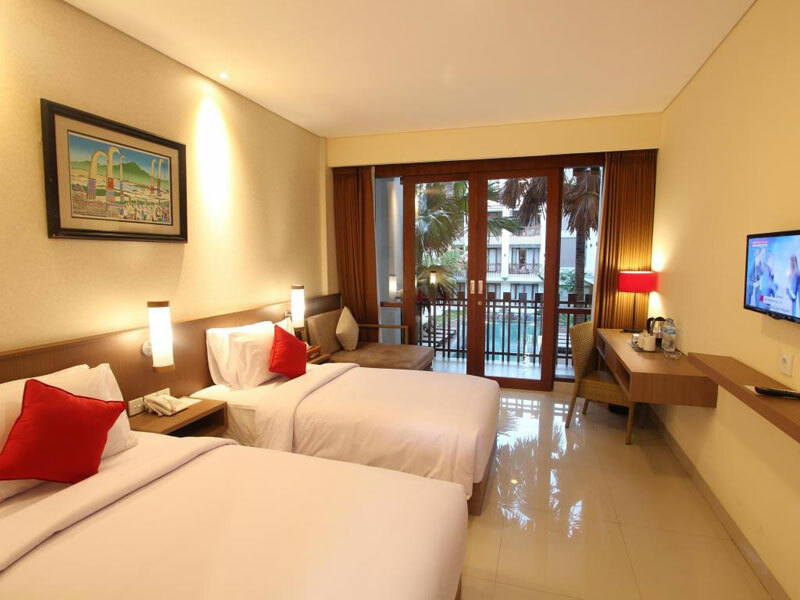 Don’t miss out on the nearby Kuta Beach. The hotel is centrally located for a sunny day at the beach, because sometimes you just need to venture out! 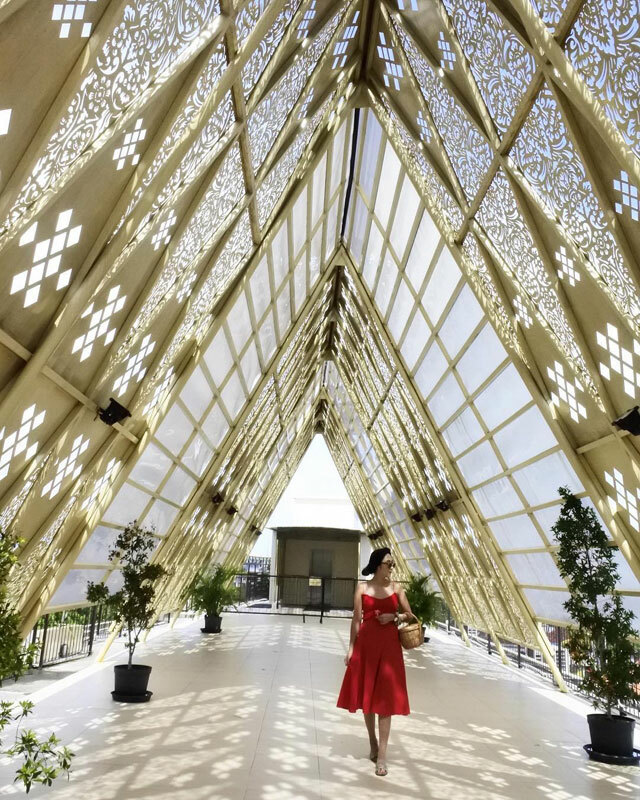 You’re also never far from an exciting afternoon in town, only a few minutes’ walk from exciting shops, bars, restaurants, and some of Bali’s best nightlife! While we love palm trees, there’s something to be said for fragrance! 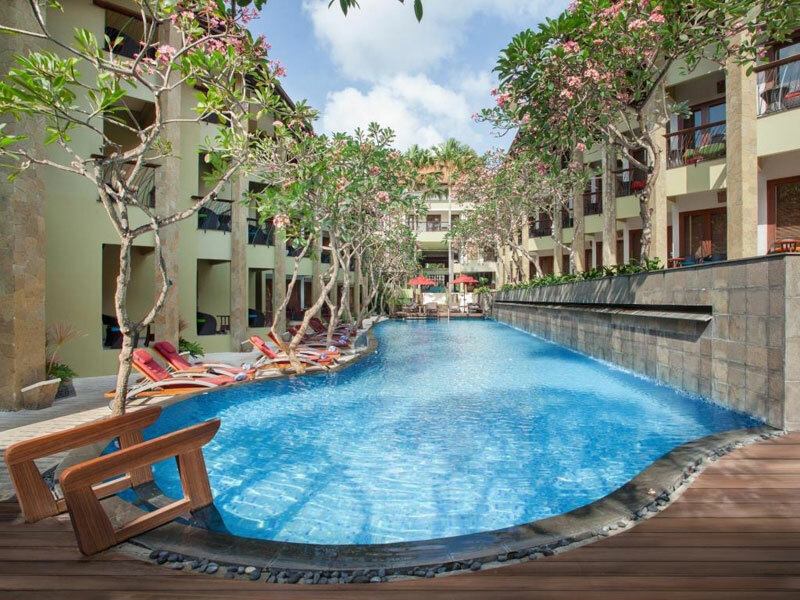 At the All Seasons Bali Hotel in Legian, the pool is surrounded by fragrant frangipani trees for the ultimate relaxing swimming experience. Relax on the sun loungers on the deck of the central pool, and a nearby bar serving cold drinks and snacks. If you don’t want to stray too far from the pool when you’re hungry, this is the perfect spot for an afternoon pick-me-up! There is an attached kids’ pool as well for those travelling as a family – perfect for keeping your energetic kiddos entertained! Don’t miss the spa, which offers a wide range of treatments for all your pampering needs – a wonderful place to have a little YOU time! When you’re done at the spa, the room could be a great place to hang out. With the funky and fun decor, this isn’t like any hotel room you’ve ever stayed in before! The bright colours, unique tiles, and bright white walls make this a fun space to hang out with friends or loved ones! 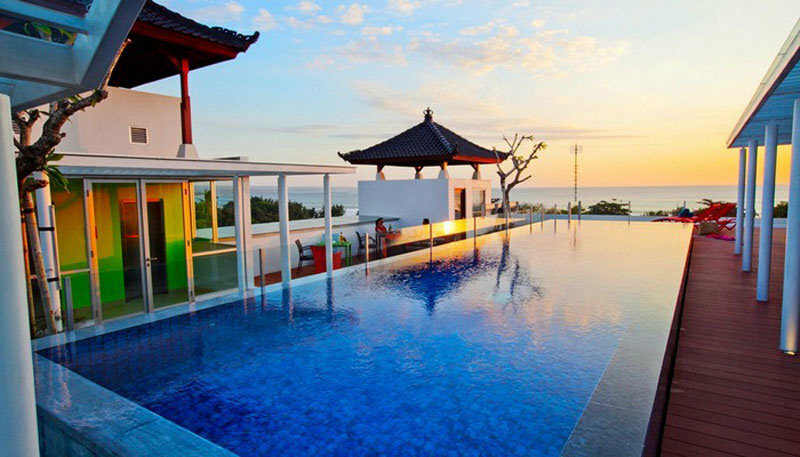 Do you know of any other affordable yet value-for-money beach hotels in the most happening areas of Bali to recommend? Do share with us! PLEASE NOTE: All the above information is correct at the date of publication. If you come across any changes or updates, please let us know and we will update the information accordingly. Thank you! 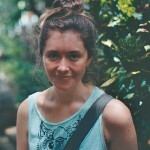 My name is Laura Jodoin, and I’m a bit of a vagabond. I’m from Vancouver, but I’ve lived in England and France & have travelled Europe and Southeast Asia. I’m constantly looking for the next place I want to travel, and wherever that may be, you can usually find me by the ocean. I love trying new things (especially food! ), making friends during my travels, and I’m always game for a challenge - and I hope to be living my life this way for a long time to come! What's on your bucket list? 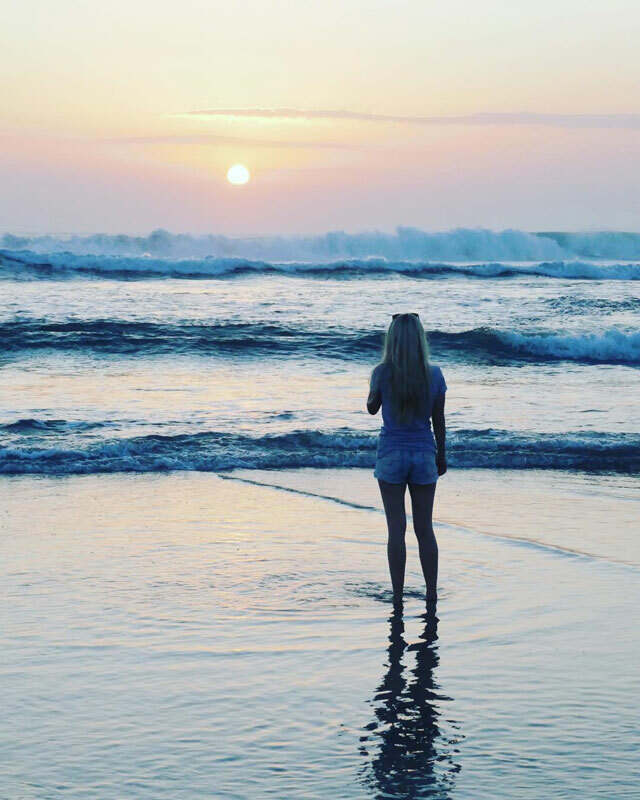 Check out these unique things to do in Bali for a once-in-a-lifetime unforgettable experience! We bring you these amazing and affordable private pool villas in Bali with your own pool that you can stay with your loved one! Who says you can't honeymoon on a budget? How much do you know about Bandung? Check out these things to do in Bandung! Just second to Bali, this destination in Indonesia has all that natural attractions and fun and shopping. We'll bring you through some of the most unique hotels and villas that you never thought you'll find in Bandung. Read on to find out! Besides art and culture, Yogyakarta is also known for its beautiful beaches of the south seas and a collection of amazing natural landscapes rarely found elsewhere. Here’s the list of the best things to do in Yogyakarta. Discover these amazing things to do in Lombok - the fieriest island in Indonesia. While others try to keep them a secret, we share them all. Visit them before others do! 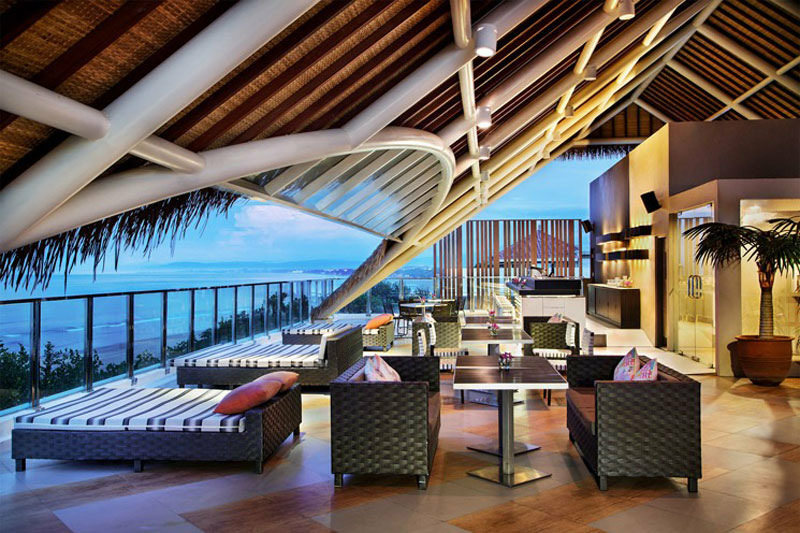 29 Bali restaurants with most spectacular views as your dining backdrop! We’ll bring you through some of the most unique hotels that you never thought you’ll find in Bali. Read on to find out! Dine with spectacular views of Bali: 27 Restaurants that will make a difference to your dining experience! From having your own private dining on water the middle of nowhere to getting a meal by the stunning cliffside, we leave you to judge these hidden restaurants where you can dine with insanely gorgeous views. You can dine and enjoy breathtaking views from the hills, of the city lights, by the lake and even paddy fields in Bandung! Here’s 14 restaurants with the best scenic views you must not miss. 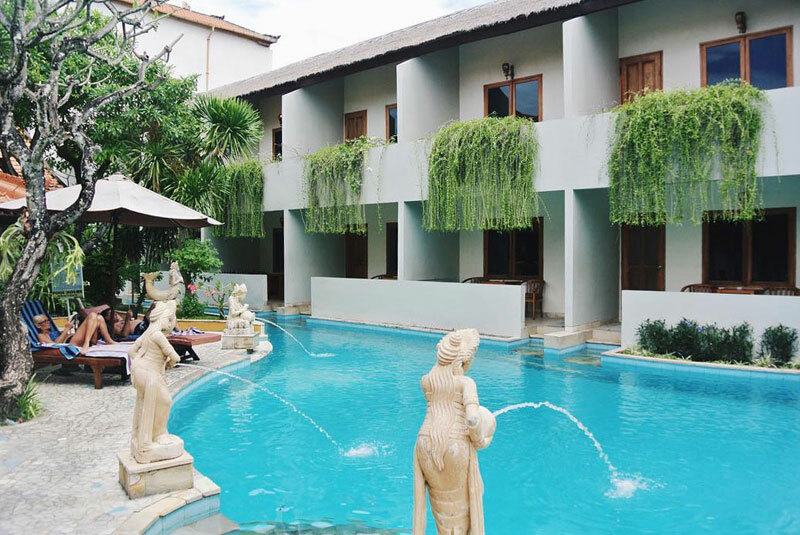 Now that you have decided to make a trip down to Yogyakarta for its culture and awe-inspiring natural attractions, take a look at these lovely boutique hotels in Yogyakarta you never knew existed! Want to take a trip to Gili islands, but unsure of how to get there and what to do? With this complete guide to Gili islands, you’ll definitely have an unforgettable trip! Ever dreamed of spending a night on an overwater bungalow and be greeted by the scenic ocean view every day? Here’s the best overwater villas in Indonesia you can think of - almost like in the Maldives!